ACCE is one of our favorite gatherings and we welcome the opportunity to meet you face-to-face. In addition to ChamberMaster, we have new apps and responsive website designs to showoff plus a sneak peek at new member benefits. We have staff at the booth to answer all your questions and jot down feature requests. 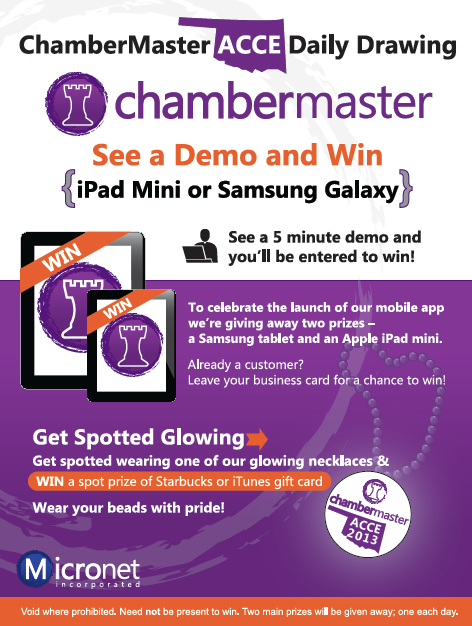 When you stop by booth #509, make sure to enter our Apple iPad Mini and Samsung Galaxy Tablet giveaway. We’ll also have some unusual freebies (that glow!) and if you’re spotted wearing them around the conference – you could win either iTunes or Starbucks gift cards.